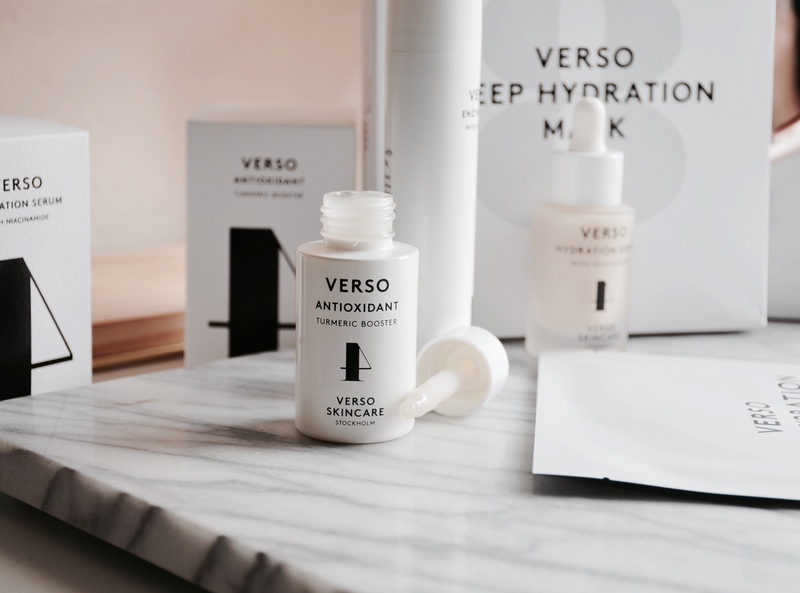 The Stockholm based skincare Verso is a new brand for me. It instantly caught my eye with their minimal monochrome packaging that is a pleasure to photograph. 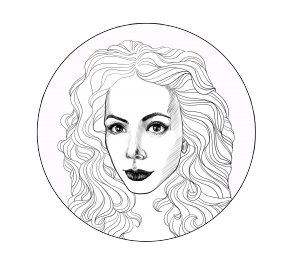 Their products are aesthetically pleasing but also very effective. Verso makes high-quality products with minimal ingredients. They don’t put unnecessary fillers in their skincare and only use ingredients that work in order to simplify our every day skincare routine. I had the pleasure of trying some of their products which all ended up working so well for my skin. First up, the Verso Antioxidant Turmeric Booster. It’s a face serum that is enriched with Turmeric and Vitamin E. It helps combat free radicals and improves the skin’s hydration capacity over time. Turmeric protects the skin against UV-radiation and decreases inflammation, while Vitamin E works to block damaging free radicals from the surface of the skin. Oat lipids and oils from the Nordic countries with water-binding properties provide further replenishment and repair. This gel serum is light. Perfect for skin that tends to become red, damaged and uneven when exposed to the sun, it leaves the skin smooth, supple and soft to the touch. In addition to Turmeric and Vitamin E, this booster contains tiny microalgae that kickstars and reinforces the skin´s antioxidant capacity, deliver powerful antioxidants and hyper-hydration. I use the Verso Antioxidant Turmeric Booster before my moisturizer both day and night. Since I have normal skin that gets dry in winter I’m hoping that the serum will help with keeping moisture in my skin especially during winter. The consistency of the serum is milky and the serum has a pleasant but subtle scent. It feels hydrating on the skin and layers really well with other serums. Another great hydrating serum is the Verso Hydration Serum. It has Niacinamide which provides moisture and long time hydration by preventing the skin from drying out. If you have dry skin, I highly recommend this serum. It is one of the most hydrating serums I’ve tried. I love it because it is super hydrating but it doesn’t leave a tacky feeling on the skin. The oat lipids and oils in this light gel serum are derived from the Nordic countries. High in content of Avenanthramides, Ceramides, Beta-glucans, Vitamin E and skin-identical fatty acids, they have efficient anti-oxidant, skin-soothing and waterbinding properties. In addition, a high concentration of Niacinamide, also known as Vitamin B3, deliver effective long-term skin barrier repair. I like to use the Verso Hydration Serum mainly at night since it’s very hydrating. I’m sure when the weather cools down I will implement it in my morning skincare routine too. After each use, my skin feels very hydrated but also plump. It was love at first use. 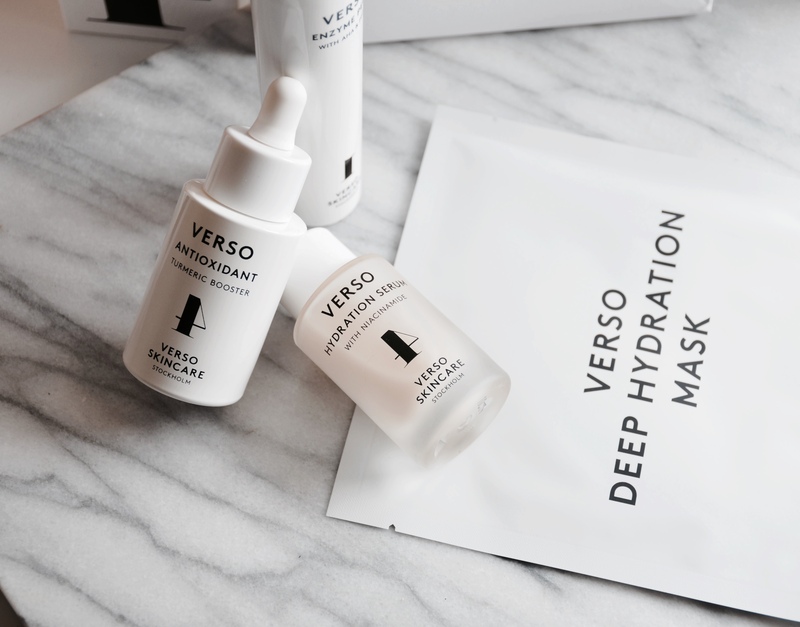 The Verso Deep Hydration Mask is another solution for dry and dehydrated skin. It provides instant hydration and moisture up to 120 hours. After using this mask I didn’t feel the need to put any other products. My skin felt baby soft and the mask just left me with a beautiful glow. I’ll definitely use this mask as a pick me up whenever I need extra hydration or even before special events. I feel like it will prep the skin really well for flawless makeup application for my normal skin. The mask delivers deep hydration with prolonged effect. Its patented Artificial Moisturizing Factor (AMF) supports the skin’s ability to retain moisture. Due to the powerful absorption ability of the AMF’s small silica particle structure the skin can stay hydrated for up to 120 hours. In addition to AMF, Verso Deep Hydration Mask contains Sodium Hyaluronate, Grapefruit Extract and Ceramide-3, which further support the AMF effect and keep the skin soft, smooth and hydrated. The Verso Enzyme Peel is the brand’s newest product. It is a gentle exfoliating gel that has AHA and PHA. It helps with removing dead skin cells, unblocks pores and accelerates cell renewal. It also brightens while leaving the skin clean but not stripped out of it’s oils. It is gentle enough so even if you have sensitive skin, you can still use it. Alpha Hydroxy Acid and Poly Hydroxy Acid are naturally occurring organic acids that contribute to accelerating the cell cycle and increasing the production of collagen. 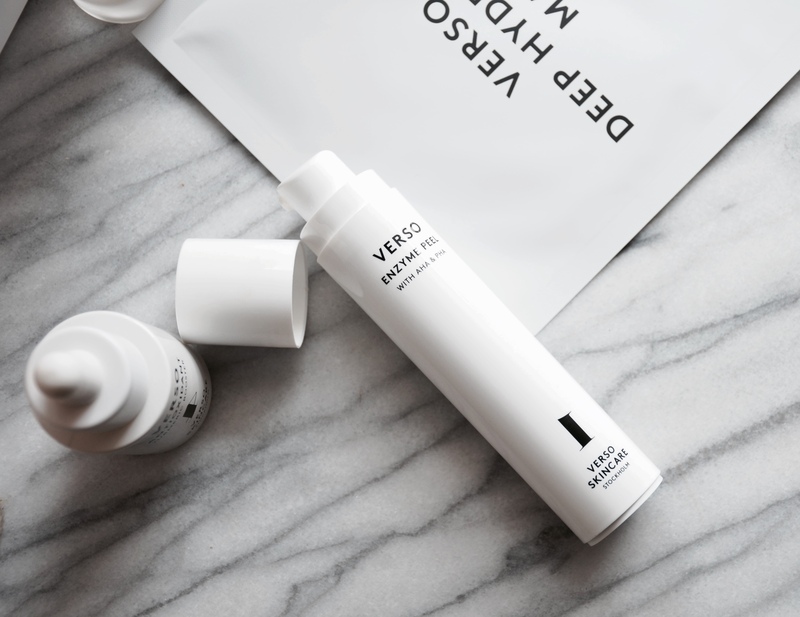 Formulated with a proprietary mix of high-quality AHA and PHA, Verso Enzyme Peel is able to gently exfoliate the outer layer of the skin while speeding up the skin’s ability to postpone build-up of dead skin. The result is a smoother, brighter and more radiant skin with significantly reduced fine lines and wrinkles. I use the Verso Enzyme Peel once a week. I feel that once a week is enough for my skin as I also use other exfoliating products. It is a great gentle exfoliator that doesn’t strip the skin but it is still effective. I feel like this would work well for normal and dry skin as it is not stripping. Although, if you need deep cleansing and have acne prone skin and a lot of clogged pores, you will probably either need to use this up to three times a week or use something that’s stronger. 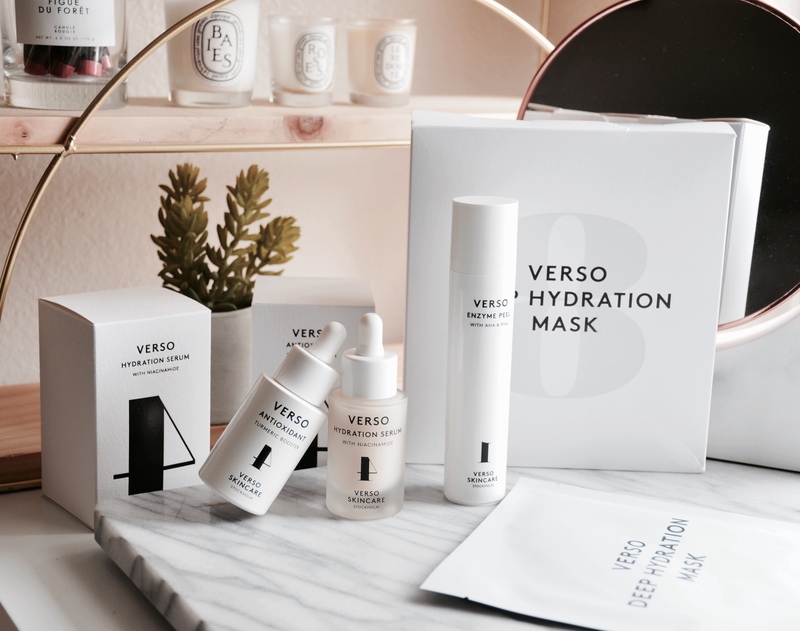 Have you tried anything from Verso Skincare? Let me know if you have any favorites from the brand that I should test.